They are Joel Nana Kusi Osei, 23; Godfred Agbeshie, 24; Abraham Mensah, aka Register, 26; Nana Amoah, aka Ras, 30 and Isaac Mensah, 32. 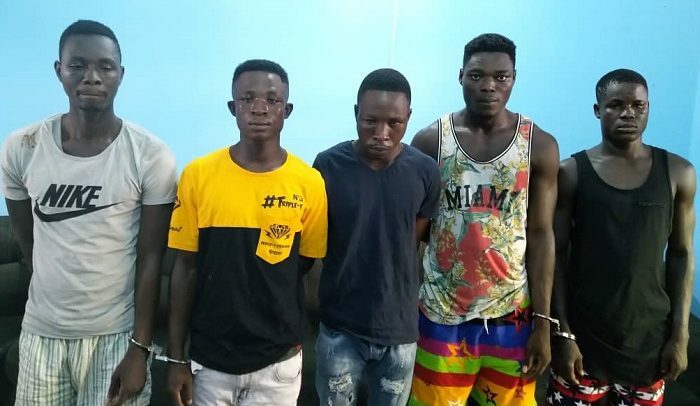 The paper learnt that the police had a tip-off that the five were preparing to rob some gold dealers at Tarkwa. “The police also got information on the suspects’ hideout and stormed there to arrest them,” a resident asserted. A search conducted on the suspects by the police revealed two revolvers and ammunition. Sources told the paper that the suspects on August 28, 2018 robbed a mobile money merchant of GH¢14,000 at Ahwitieso, near Tarkwa, after they had trailed the victim from the Tarkwa Main Lorry Station.